This is the public profile of Danny Cheng, Additional information and high-resolution images are available for accredited press members, to access additional information about Danny Cheng please login as a press member. About Danny Cheng : Danny Cheng graduated from the International Academy, the first award in APIDA in 2005. Has received more than 100 different awards in the industry. Originally designed by the residential, has so far expanded to improved units for developers planning, wine Shop, sales offices. From 2012 onward, the company's business from Hong Kong to expand to China Mainland market. 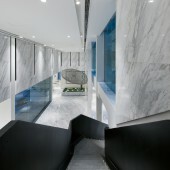 Danny Cheng Interiors Ltd (2002 - 2005) The initial business development is dominated by private residential and office. Danny Cheng Interiors Ltd (2006-2016) business development in addition to residential, but also began to participate in the model room, fine decoration design in Hong Kong, in recent years have also come into contact with China, Hong Kong and Macao real estate development projects, To design all kinds of model room, public space, clubs and large sales hall. Press Members: Request an exclusive interview with Danny Cheng.